Professional Builder talks to Rowan Minkley, the 23-year-old behind Chip[s] Board, an MDF substitute made from industrial potato waste. Rowan Minkley has recently been named the UK’s most promising young engineering entrepreneur by the Royal Academy of Engineering Enterprise Hub and awarded £15,000 to kick-start his business. Rowan’s innovation is a wood substitute designed to be an eco-friendly alternative to MDF, and it has already peaked the interest of high-profile companies like McCain and Ikea. Professional Builder: What was the inspiration behind the product? Rowan Minkley: The journey of Chip[s] Board began during my studies and freelance work with co-founder Robert Nicoll. Working across a range of design and fabrication projects, we were both overwhelmed by the lack of value and short lifespan of materials. We were inspired to find a new solution and sought to develop a new material that – if treated in the same disposable manner – wouldn’t have the same significant environmental impact currently generated by material disposal. PB: What applications can it be used for? RM: Much like current particulate boards there are countless uses for our material. However the sustainable, circular nature of the materials lends themselves to industries that need short term materials, for example exhibitions that need to be built quickly and cheaply, before being taken down again. Our materials are all biocompatible and recyclable to negate these damaging effects. This means that in the future, industries such as retail and events will not have as much of a damaging impact as they do today. PB: When do you think it will be available to builders and other UK trades? RM: Currently we don’t have a fixed production date as we need to ensure we meet all the relevant BS EN standards and regulations after completing an industrial trial run. Having won the Royal Academy of Engineering Enterprise Hub Launchpad Competition, we are now in a much stronger position to take our materials from lab production, to a globally licensed business. The support we have received and connections we have made through the Enterprise Hub will help speed up the process of trial runs and testing. 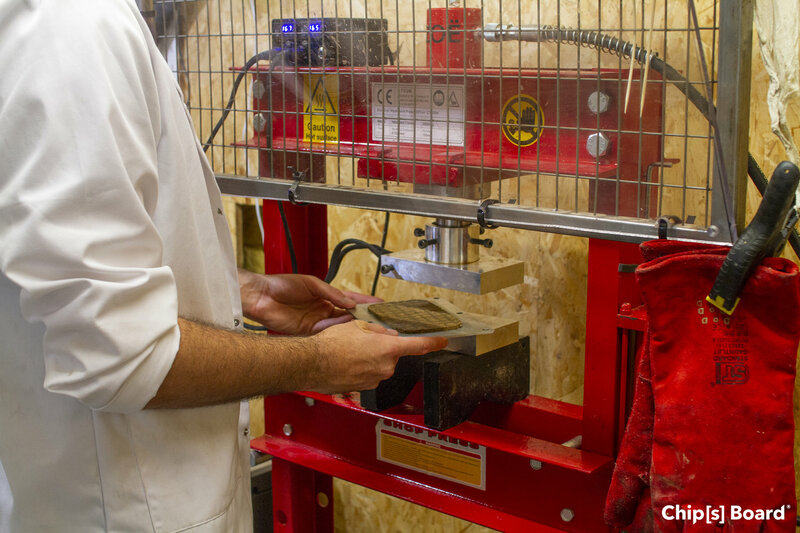 During the next six to 12 months we are looking for companies to work as beta testers – working with the material as we refine its properties – to give us first hand feedback on its in-situ applications. PB: What will be the advantages over more traditional products? RM: Our materials are beneficial because of multiple sustainable benefits. Firstly we use a waste stream, reducing the use of raw materials. Secondly they are carcinogen free, improving the health of people working and surrounding themselves with the materials. Lastly they can be broken down into compost after use, reducing the amount of material going into landfill.